You've been hanging off rock faces, scaling Slovenian peaks and shooting down sledge runs. Our extreme t-shirt wearing competition has certainly given you chance to show off your adventures! We've seen you wearing your exclusive Apex Challenge T-shirts in loads of places worldwide. There's now even more time for you to send us some more extreme pictures. The deadline's been extended until May 1st and we'll announce the winner of this year's extreme t-shirt wearing competition at the Overnight Challenge on the weekend of 13th and 14th May 2006. The winner will receive a brand new digital camera! So keep wearing your t-shirt, keep doing great things, and keep sending us the pictures! Wear you Apex Challenge T-shirt in the most impressive place you can think of. Take a photo of yourself and email it to us. The most impressive photo will be the winner. We'll put examples of the ones you've sent us on the website as they arrive. 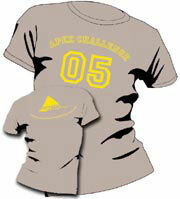 And don't forget to pre-order your exclusive 2006 Apex Challenge t-shirts when you enter the May event!